New ideas about Pluto, Charon, and all the little moons have been flowing back from the New Horizons spacecraft fast and furious. If you’re curious but haven’t kept up, here’s everything we’ve learned so far. The New Horizons spacecraft is on a decade-long mission exploring deep space. It just completed the first-ever flyby of Pluto, a dwarf planet and the first Kuiper Belt Object ever explored. The spacecraft can either make observations or communicate with Earth, so for now it’s focusing on getting more data and sending back just the barest, highest-priority data in its failsafe downlinks. Even that tiny trickle of data has been enough to completely overthrow our theories of what we expected to find at the icy little world and its family of moons. Once we were up-close and personal, we could finally make an accurate measurement of the dwarf planet’s size: 2,370 kilometers (1,473 miles) in diameter, give or take 20 kilometers. This makes it the largest dwarf planet, and the undisputed King of the Kuiper Belt. It’s challenging to describe the terrain of Pluto because it’s a complex, diverse world with distinct regions. It has a polar cap of methane and nitrogen ice, with more methane unevenly distributed across the surface of the dwarf planet. The darkest regions have yet to be explored in detail, but are already bearing the names of dark gods. We don’t yet know what processes are driving geological activity on Pluto. Current theories are that Pluto has an unexpected heat source, stored heat, or is more efficient at using heat. While we haven’t figured out the connection yet, this young region is also the only place we’ve found with a disproportional concentration of carbon monoxide. In terms of specific terrain, we’ve found a mountain range, Norgay Montes, equivalent to the Rockies here on Earth, and vast weirdly-textured plains, the Sputnik Planum. 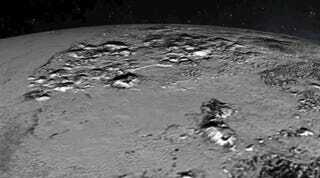 The rugged mountains are made of hard ice, possibly water ice which approximates the strength of rock at Pluto’s frigid temperatures. The textures on the plains are most likely caused by either thermal contraction during cooling, or upwelling from subsurface convection. 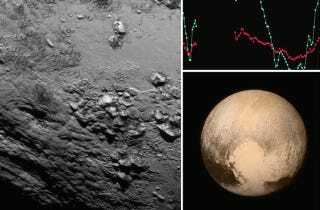 The atmosphere of Pluto is also producing surprises. The dwarf planet has an ionized tail like a comet, produced by nitrogen from its atmosphere leaking into the solar wind. The rate of escape is staggering: it’s possible 450,000 kilograms (500 tons) of gas are escaping the little world into space every hour. We need to download more data before we can pin that number down more firmly, but whatever it turns out to be, it’s producing a massive bubble of ionized particles around Pluto. Charon is Pluto’s largest moon. At nearly half Pluto’s diameter and 10% of its mass, the moon is the largest in proportion to its world in our solar system. This means that instead of inducing a small wiggle in Pluto’s orbit, both moon and dwarf planet orbit a spot in space marking the center of mass between them. We got our first surprise when Charon was still a fuzzy blur in the distance: the massive moon had a smeared dark polar cap. Now named Mordor, the cap is still provoking more questions than answers. We know it’s big and red; that’s about it. Mission scientists have speculated that from some angles, it almost looks like an impact basin from a colossal collision. We’ll know more later when we start getting spectra back to tell us about chemical composition on the surface of the moon. When the surface of Charon first came into view, I described it as being probably fairly dull. I was totally wrong. Although more cratered than Pluto, Charon also has fewer craters than we anticipated. This leads to questions about if some process may have been resurfacing the moon in the not-too-distant past. The landforms of Charon are also provoking riddles. Leading up to the flyby, we spotted epic cliffs running 1,000 kilometers (600 miles), and a crack into the world that puts the Grand Canyon to shame by digging 7 to 9 kilometers (4 to 6 miles) into the moon. In the first close-up look, we spotted a scattering of craters and cracks of yet-to-be-determined origin that are nicely familiar. We also found a new mystery: what looks like a sunken mountain, a sharp peak surrounded by a wide moat dimpling the surface. We haven’t yet received the data that will let us determine if Charon steals traces of Pluto’s escaping atmosphere, but it’s coming. Nix and Hydra are the larger of Pluto’s four other known moons. Each got their first close-ups this week, revealing them as lumpy, asymmetrical rocks instead of the bare few-pixel specks we’d seen before. Nix is 40 kilometers (25 miles) in diameter, and elongated to a yet-to-be-determined extent in the other dimension. Hydra is decidedly lopsided and lumpy, about 48 kilometers by 33 kilometers (27 miles by 20 miles). While they don’t necessarily look impressive in their current pixellated glory, once we get the lossless downloads without compression artifacts researchers will manage to pry out all sorts of secrets from these tiny moons. The probe also captured photographs of the diminutive Styx and Kerbeos, but they won’t be downlinked for a while. The specks of moons will only be about twenty pixels, but that’s still an impressive improvement over what we have now. The New Horizons spacecraft launched in January 19, 2006 in the highest-velocity escape from this planet ever attempted. It picked up a boost on its way past Jupiter, simultaneously shedding the last of its protective instrument caps. After a nearly decade-long journey, the spacecraft reached its closest approach to the Pluto-Charon system on July 14, 2015. After waking up from hibernation last December, it entered approach mode in January. The spacecraft collected data through the approach, through the flyby, and now during its departure from the system. It’s going to keep collecting data off and on through the departure phase until early 2016. The spacecraft has been performing excellently. It was right on target during the approach, hitting a trajectory well-within both the targeted and ideal ranges. In an awe-inspiring demonstration of the beauty and precision of well-planned trajectories, New Horizons arrived within 72 seconds and 70 kilometers (43 miles) of its targeted closest approach. It’s not all sunshine and happiness: the probe had one heart-stopping hiccup when an error on July 4th sent it into safe mode. The team heroically worked around a 9-hour ping time to get the problem resolved and the probe was back online after missing only three of its scheduled (non-essential) photographs. After the flyby, the spacecraft is still in fantastic shape. New Horizons instruments are powered by a small radioisotope thermoelectric generator that will keep it running into the 2030s by converting the heat of decaying plutonium into electricity. While the spacecraft is going far too fast to swing into orbit around the Pluto-Charon system, its thrusters have enough propellent remaining to redirect it to a flyby of a second Kuiper Belt Object. Even then, the science isn’t done: New Horizons can keep exploring deep space as it exits the solar system like the Voyager 1 and Voyager 2 probes are doing. This extra science doesn’t depend on the spacecraft: it’s all going to come down to if the extended mission funding is approved to keep the Deep Space Network listening to New Horizons after the data downloads (and primary mission) complete in 2016. The entire primary mission — development, construction, launch, operations, and outreach — is only $700 million spread over ten years, and was both on-time and under budget. The mission isn’t over yet. The data will be downloading through the fall of 2016, sending full lossless datasets home at a painful 2 to 4 kb per second. Automatically processing the data into images is running into a few bumps that is slowing down public release, but we’re still getting a flood of beautiful images from deep space to feed our curiosity. After the data is home, with a bit of luck, the New Horizons spacecraft will hold two exploration records: One for making the first-ever flyby of a Kuiper Belt Object, and then again for making the first flyby of an entirely different, never explored Kuiper Belt Object. In an adorable bit of bonus history for space exploration, the first data back after the Pluto flyby arrived exactly 8 minutes, 20 seconds shy of the 50th anniversary of Marinier 4 sending home the first photograph of another world. New Horizons is in departure phase, balancing collecting more observations with downlinking the most critical mission data. The data I’m looking forward to are high resolution stereopairs of Pluto’s terrain (allowing us to see relief in three dimensions), Nix in colour, a higher resolution look at Hydra, more spectra on chemical composition, and temperature measurements. We’re also still collecting data on the space around Pluto, checking out dust distribution, checking for traces of escaped atmosphere, and watching how high energy particles and plasmas interact with the miniature system. Beyond that, I’m sure we’ll be getting all sorts of surprises we haven’t even thought of yet. We’ll be getting data from New Horizons for 16 months, but the last of NASA’s prescheduled press conferences is on Monday so the deluge of new ideas will take a brief hiatus soon. As for the spacecraft: New Horizons can make a second Kuiper Belt flyby and explore deep space, but only if the extended mission is approved for after 2016.